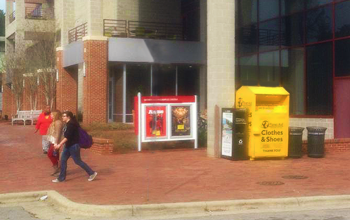 Host a Bin - Planet Aid, Inc.
Our signature yellow bins have become a hallmark for clothes recycling and donation in the United States, attracting and encouraging individuals to drop off their clothing at convenient locations. For more than 20 years, we have been providing this service free of charge to participating companies, government agencies, colleges, schools, and other entities. These partnerships great benefit communities. Most municipalities in the U.S. do not offer textile recycling, so making our yellow bins convenient for people to use helps keep recyclable materials out of landfills! With more than 19,000 donation bins in parking lots and along storefronts across the nation, we gather and recycle more than 100 million pounds of clothing and shoes annually. It is easy and hassle free to host one of Planet Aid's clothes collection bins at your business. Just call your local Planet Aid office to schedule a visit to your site. Emergency pick-ups are made within 24 hours of contacting Planet Aid. Planet Aid is a nonprofit organization and donations to Planet Aid are tax deductible.